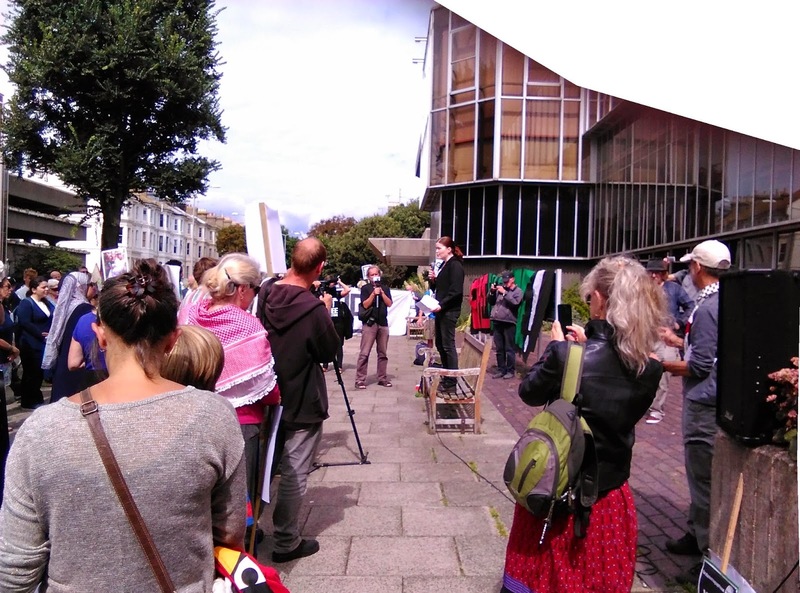 On a sunny Sunday lunchtime, some 250-300 people rallied outside Brighton Town Hall to listen to speeches and a march to Hove Town Hall. 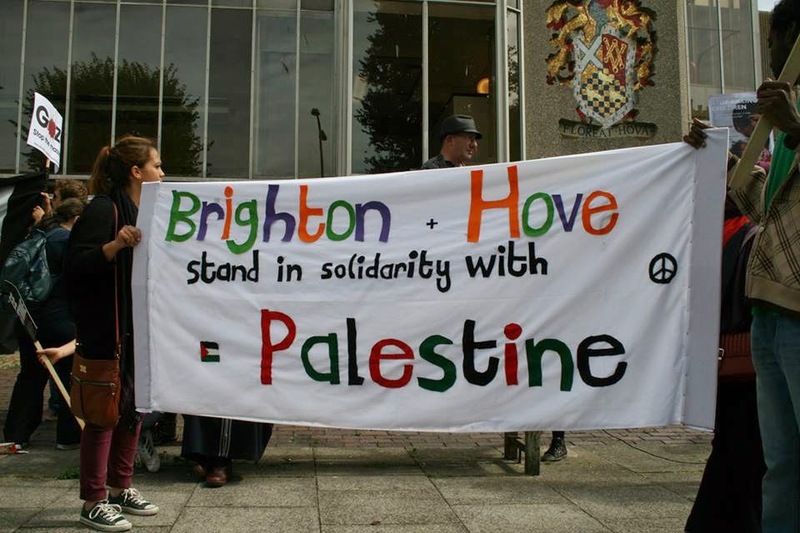 The occasion was the launch of a campaign to persuade Brighton & Hove Council, the first in the country controlled by a (minority) Green Party administration to institute a boycott of Israel. Proposed by Cllr. Ben Duncan, who was forced to resign from the Green Party for calling the British Army ‘hired killers’ (what else are they? social workers?) Ben has been one of the few Green Party councillors (now an Independent) to remain committed to direct action. However it is difficult to see the Labour or Tory groups supporting the proposal, which is due to come to the Council in October. 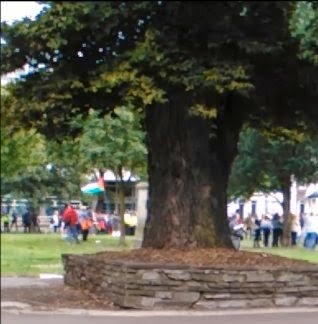 Ben was also the second speaker at the march. The best speech was also the first speech, by Canon Paul Ostreicher, a refugee from Germany in 1938 because of his Jewish heritage. Paul has devoted his life to fighting for peace (a non-sequitur!) being Chair of British Amnesty, expelled from the Church Peace Council for criticisms of the Soviet Union among his other notable achievements. He was ordained as a Deacon in St Paul’s Cathedral in 1959 and retired as canon of Coventry Cathedral in 1998. He now lives in Brighton and made a fiery speech pointing out that the ANC and all liberation movements were called ‘terrorist’ and defending the right of any oppressed people to take up arms. 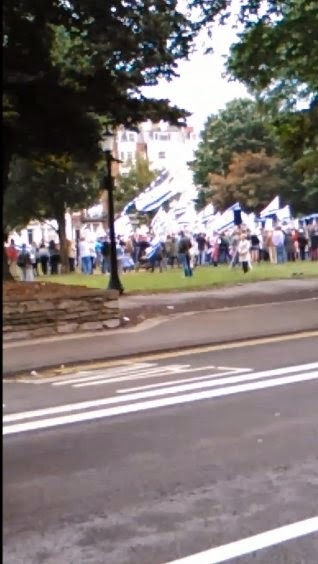 The march was a local one but despite that was larger than the Zionist one last week which was a national one. 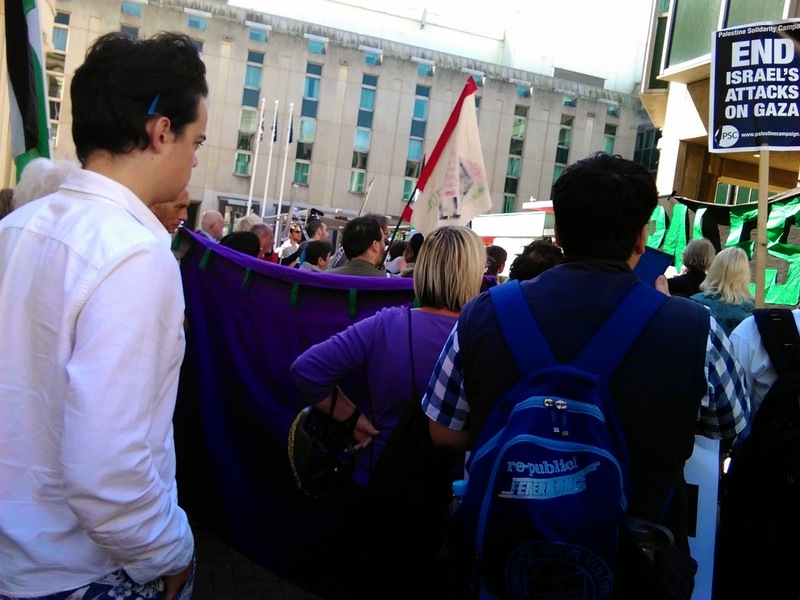 At Hove Town Hall we listened to more speeches, including one from the local PSC Secretary Barry, before dispersing. 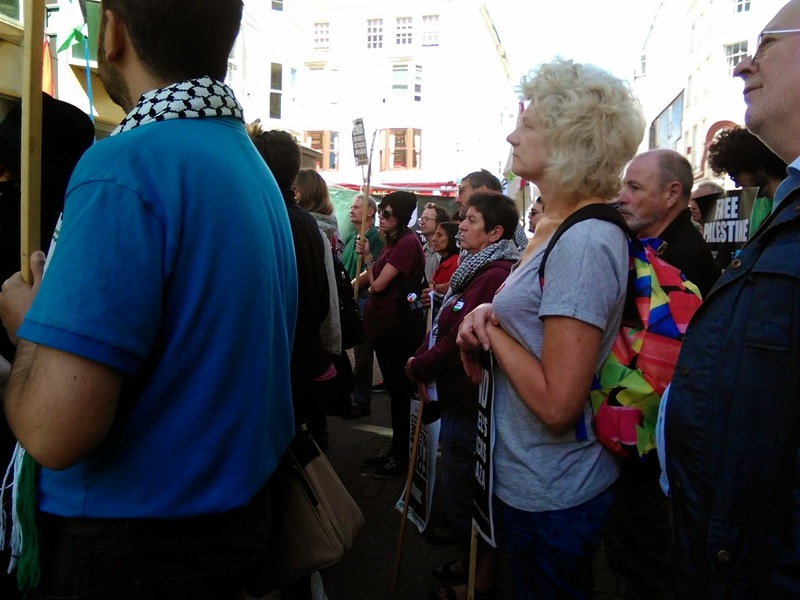 Some people joined PSC members in taking part in an action against the Robert Dyas shop in nearby George Street, Hove which stocks Sodastream products. 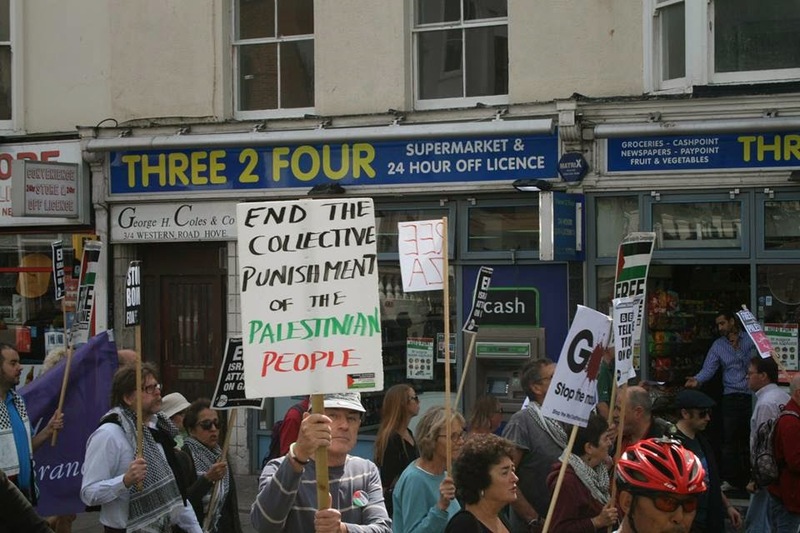 Barry laid heavy emphasis on our victory in closing the Sodastream shop in Brighton, despite a vigorous Zionist campaign to keep it open. Just a couple of criticisms or observations. 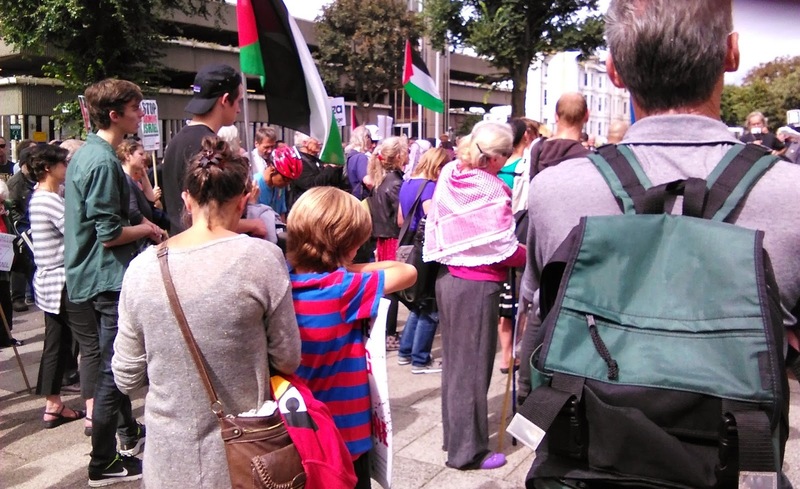 Although the demonstration was a healthy size, it was smaller than past demonstrations on Gaza. Last time, during Operation Cast Lead 1,500 people marched through Brighton. The missing factor was members of the local Arab and Muslim community. This was an omission that needs to be rectified. 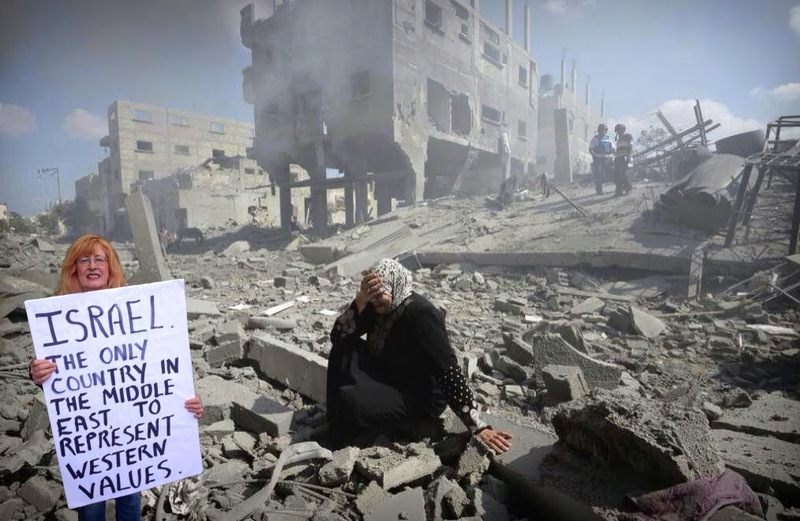 PSC has always been able to tap into existing networks of Palestinians and Arabs and we need to think carefully about why that didn’t happen this time. Secondly, despite having a Jewish Chair, Mike W, there was no speaker from a Jewish anti-Zionist or even non-Zionist organisation, again for the first time I can remember. At a time when Israel claims its actions are on behalf of all Jews everywhere this is an important omission and should not be the subject of sectarianism. 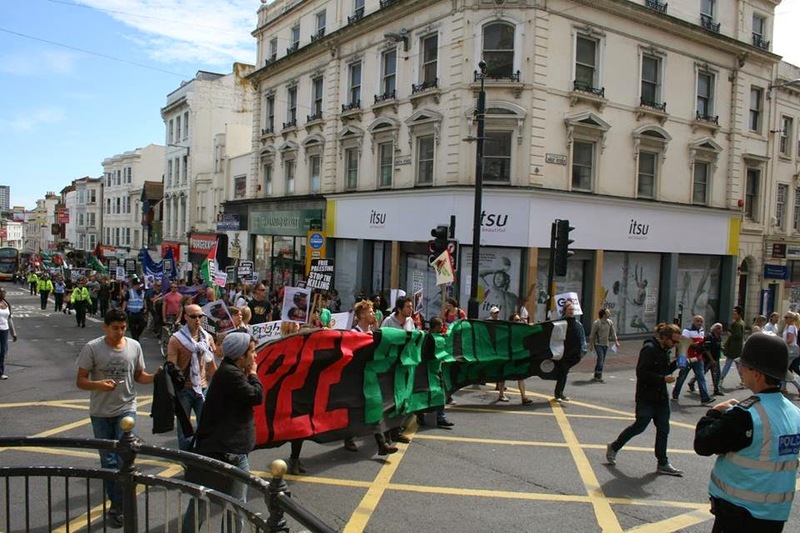 One of the main features of recent demonstrations nationally have been the presence of a large Jewish bloc and we know from the Sodastream demonstration that the Zionists find it difficult to explain away the existence of Jewish opponents. I’m thinking of groups like Jews 4 a Just Peace for Palestinians, Jews for Boycotting Israeli Goods and the Jewish anti-Zionist Network. 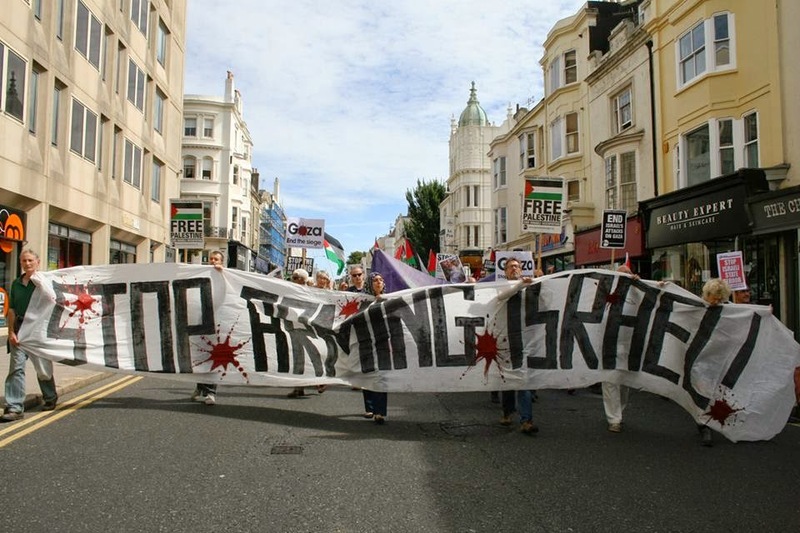 This is at a time when British Jews are showing that they are not interested in rallies supporting Israel’s barbarities. For the first time ever, the Zionist Board of Deputies of British Jews has not even attempted to organise a ‘rally in support of Israel’. Last time just 5,000 answered the call unlike in previous years when up to 25,000 turned out. However overall the energy and commitment of those who did turn out for the demonstration was commendable and if Israel’s attacks continue and intensify we need to seriously consider a major demonstration on a Saturday. 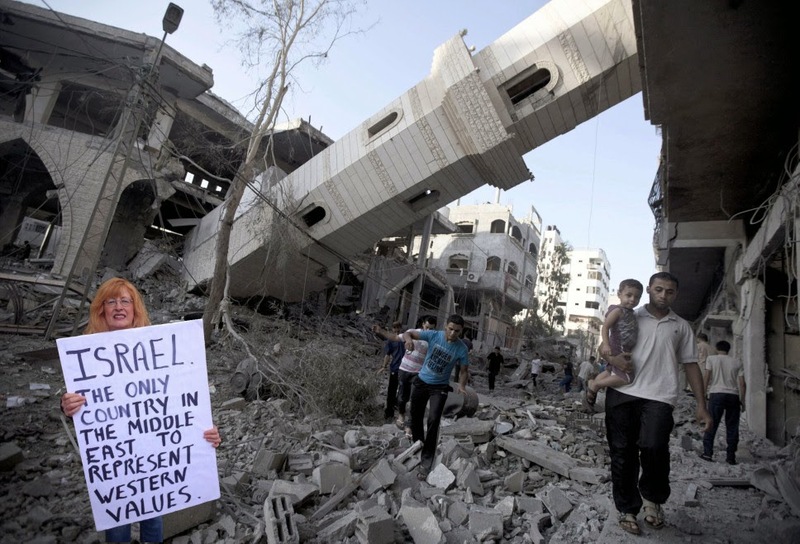 Why Israel's Western 'values' are superior to its neighbours. 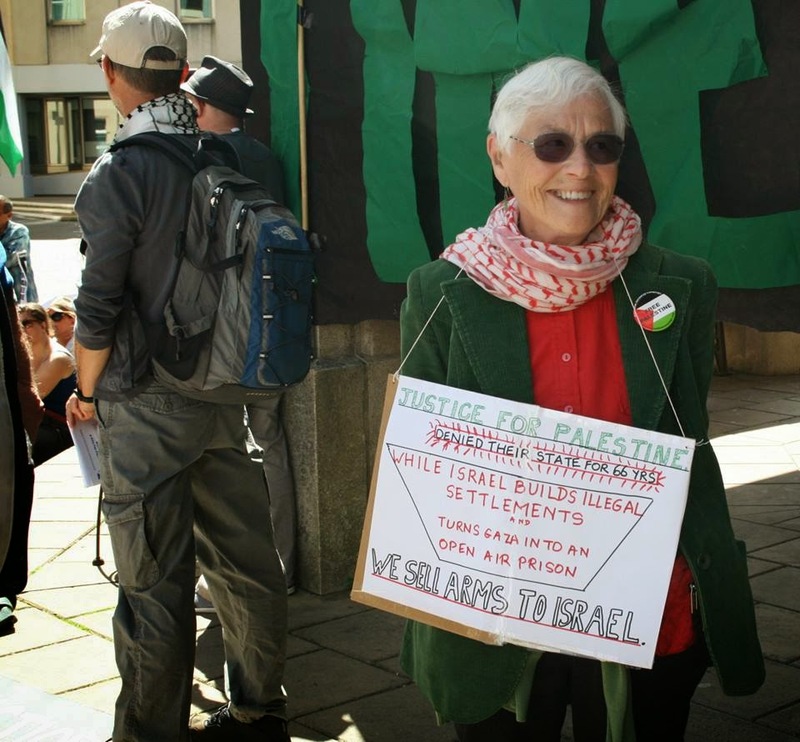 Jill Young is one of the Christian Zionists who sprouted at the time of the Boycott of Brighton’s SodaStream shop. 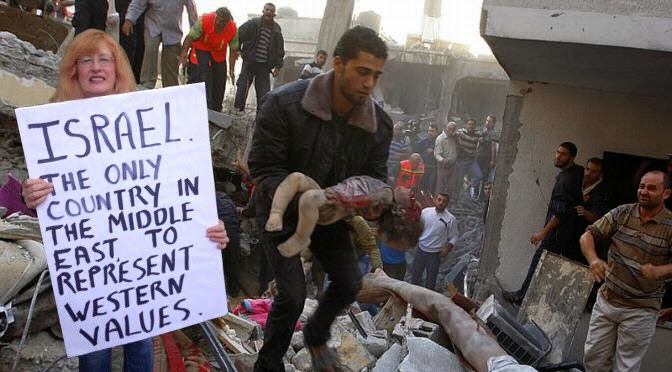 Here she is with a favourite placard of hers extolling the virtues of Western democratic values. As a fundamentalist Christian Jill Young gets around! Zionism’s Last Call on the Jewish community was a triumph for its anti-Semitic allies. 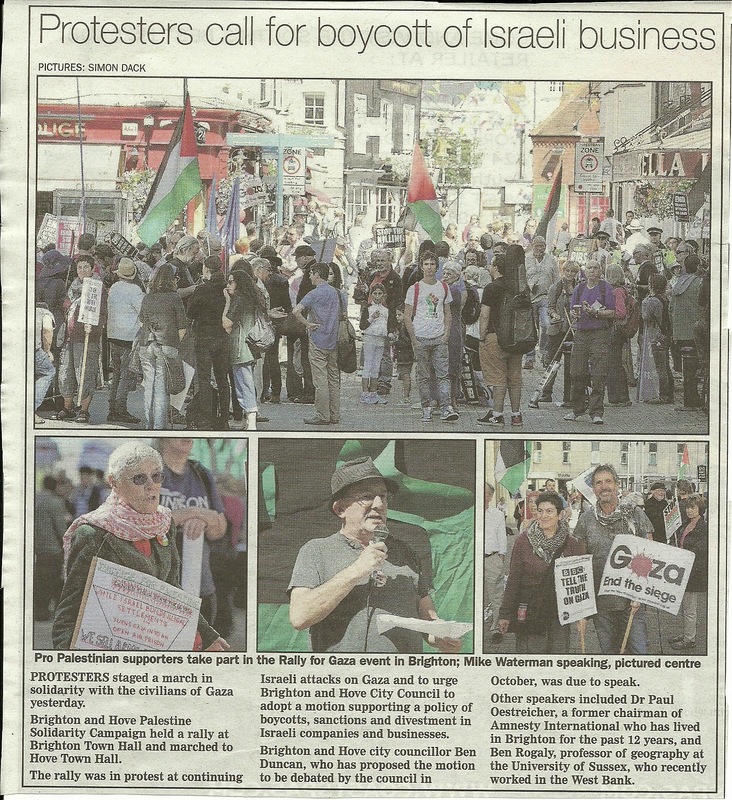 Zionism’s advocates in Brighton were flushed with success at their campaign to defend Sodastream, even if it did lead to the closure of the Brighton store. The Zionists have now taken to harassing a Kurdish demonstration and a ‘pop-up’ demonstration outside Robert Dyas. 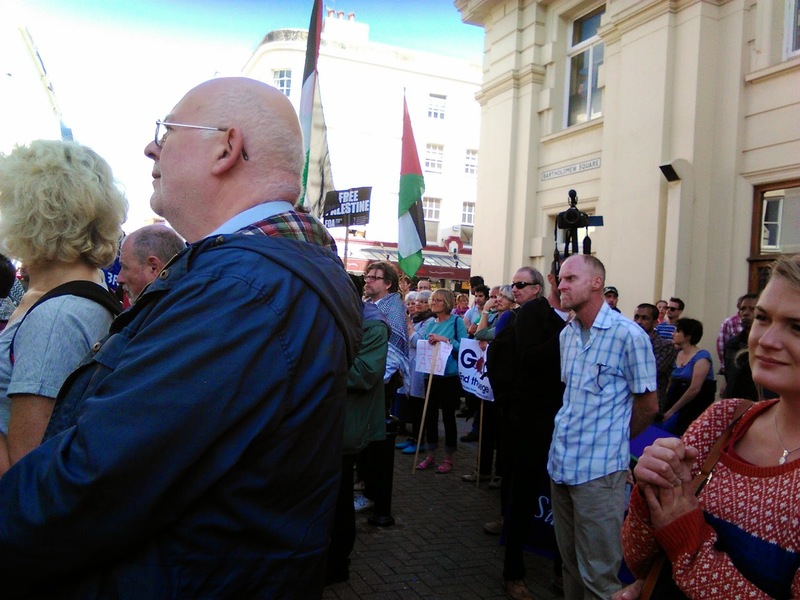 Sussex Friends of Israel i.e. 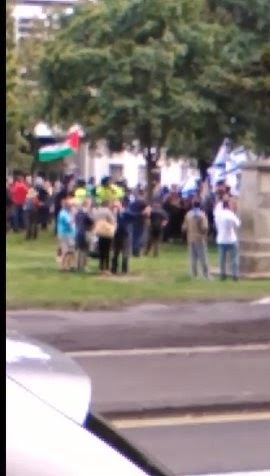 Simon Cobbs of the fascist Jewish Defence League, decided to organise a ‘national’ demonstration in support of genocide in Gaza. 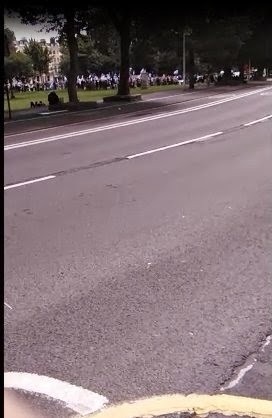 So last Sunday 17th August the great demonstration was held. 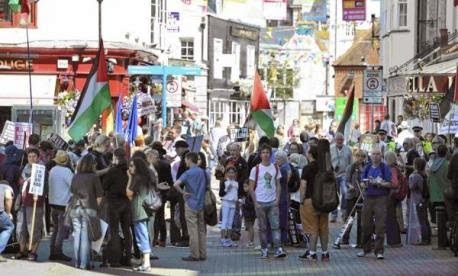 The local Argus estimated that a magnificent 200 people took part, a figure that would put Palestine Solidarity Campaign in Brighton to shame if any local demonstration attracted even double that number. 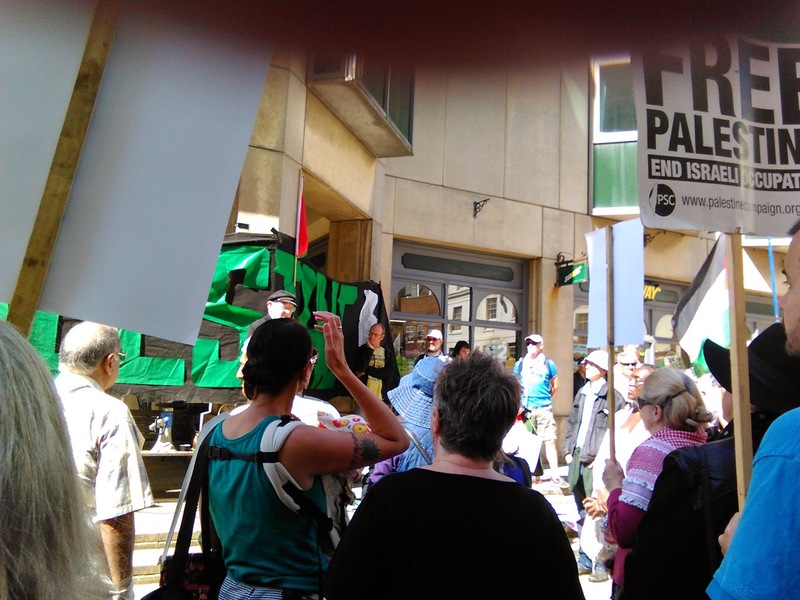 When we think that the last demonstration in support of the people of Gaza in London, on August 9th, attracted 150,000 people, we get a flavour of Simon Cobb's achievement. 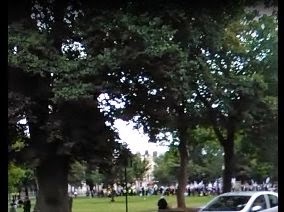 A contingent from Antifa (Brighton anti-fascists) turned up to make it clear what they thought of this bunch of racists. 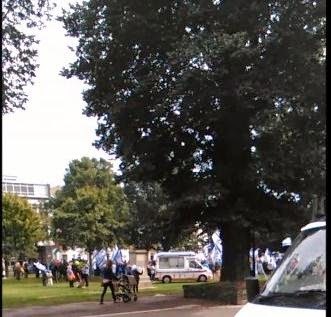 It is a sign of how demoralised Zionism’s supporters are that they could not find more than 200 people for a march to raise enthusiasm for colonial butcher. 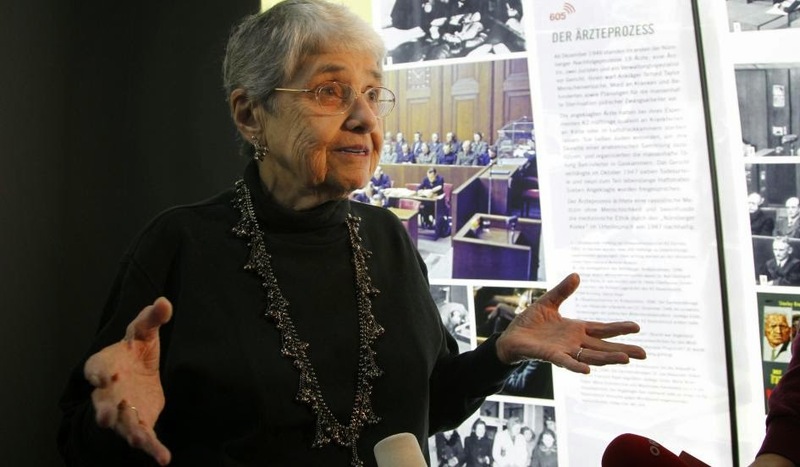 90 year old Hedy Epstein, a survivor of an extermination camp, has been particular active in the fight against racism. 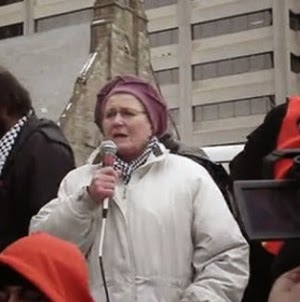 She was on the Gaza Freedom Flotilla and was recently arrested in Ferguson, Missouri protesting against Police racism. With the exception of a few disgusting individuals like Elie Wiesel, who repeats the old canard, previously used against the Jews, that the Palestinians are guilty of child sacrifices, most holocaust survivors understand that the racism they experienced at the hands of the Nazis should not be visited on the Palestinians. A 91-year-old Dutch man who was declared a Righteous Among the Nations for saving a Jew during the German occupation on Thursday returned his medal and certificate because six of his relatives were killed by an Israeli bombing in the Gaza Strip last month. 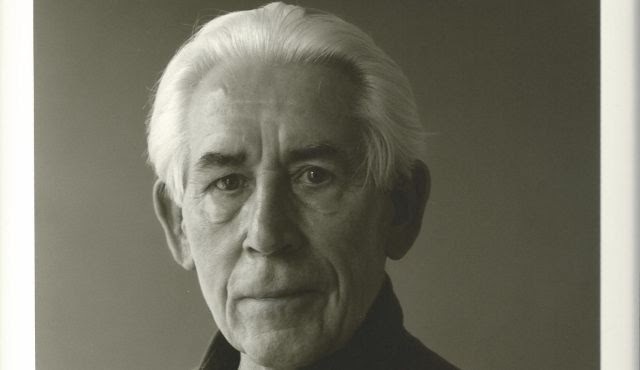 In 2011, the Yad Vashem Holocaust museum declared Henk Zanoli and his late mother, Johana Zanoli-Smit, Righteous Among the Nations for having saved a Jewish child, Elhanan Pinto, during the Nazi occupation of Holland. Pinto, born in 1932, was hidden by the Zanoli family from the spring of 1943 until the Allies liberated Holland in 1945. His parents perished in Nazi death camps. In hiding a Jewish child, the Zanoli family took a double risk, because it was already under Nazi scrutiny for having opposed the German occupation. Zanoli’s father was sent to the Dachau concentration camp in 1941 due to his opposition to the occupation, and he subsequently died at the Mauthausen concentration camp in February 1945. 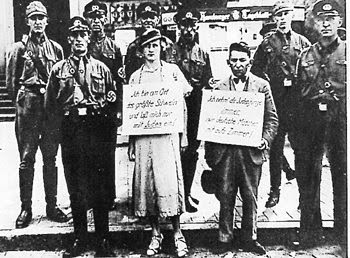 Henk Zanoli’s brother-in-law was executed because of his involvement in the Dutch resistance, and one of his brothers had a Jewish fiancée, who was also killed by the Nazis. Zanoli’s great-niece, Angelique Eijpe, is a Dutch diplomat who currently serves as deputy head of her country’s diplomatic mission in Oman. 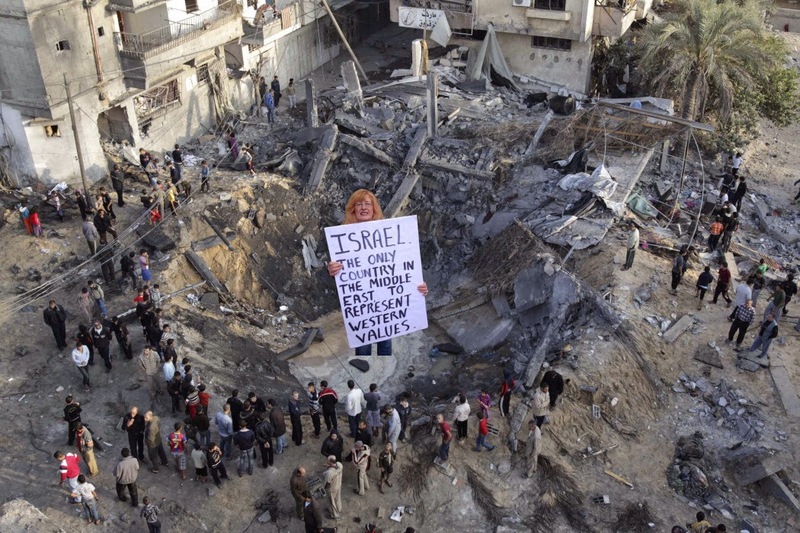 Her husband, economist Isma’il Ziadah, was born in the al-Bureij refugee camp in central Gaza. The couple has three children. Ziadah’s parents were born in Fallujah, on whose lands the town of Kiryat Gat now sits. His father died in 1987. 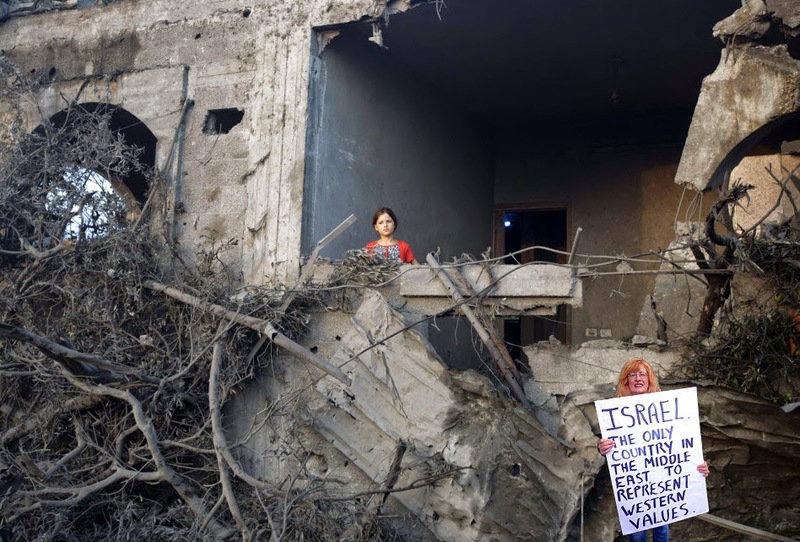 On Sunday, July 20, an Israeli fighter jet dropped a bomb on the Ziadah family’s home in al-Bureij. The bomb killed the family matriarch, Muftiyah, 70; three of her sons, Jamil, Omar and Youssef; Jamil’s wife, Bayan; and their 12-year-old son, Shaaban. 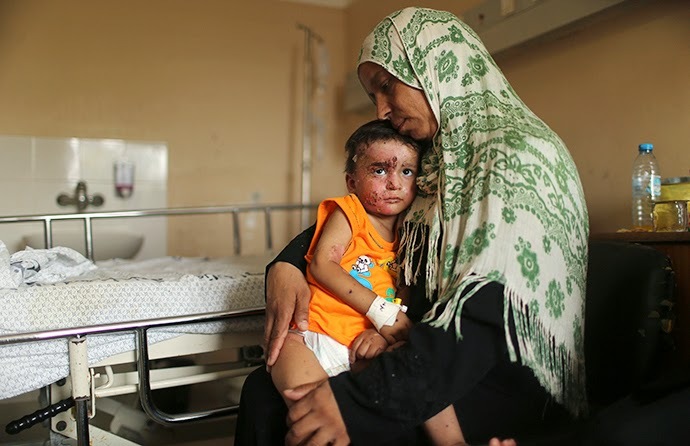 The bombing thus orphaned Jamal and Bayan’s other five children, four daughters and a son, while bereaving Omar’s two sons and Youssef’s three sons and a daughter of their fathers. The bombing also killed Mohammed Maqadmeh, who happened to be visiting the family that day. Zanoli, an attorney by profession, heard about the killing of the Ziadah family from his niece. As a way of expressing his shock and pain, he decided to return the medal and certificate that were awarded to him and his mother (posthumously) as Righteous Among the Nations. Because of his age and poor health, he did not do so in person, but sent them by messenger to the Israeli Embassy in The Hague – the same place where he received them in an official ceremony three years ago. In the accompanying letter, addressed to Ambassador Haim Davon, Zanoli began by describing the price his family paid for resisting the Nazis and their successful effort to save a Jewish child. 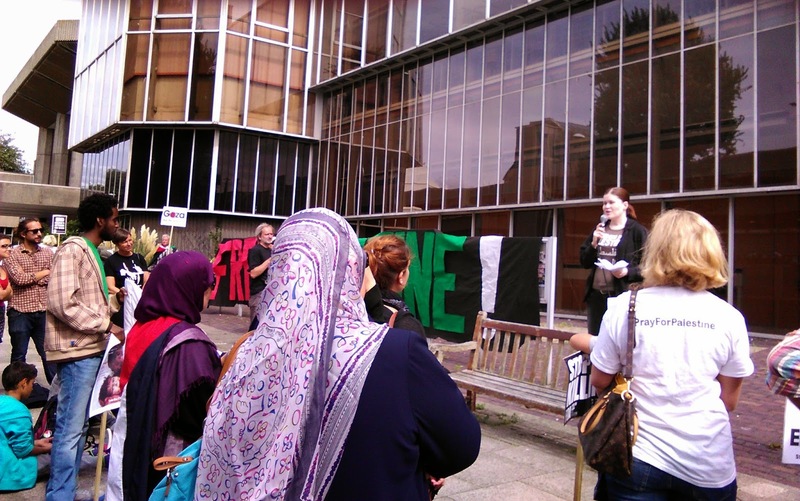 “Against this background it is particularly shocking and tragic that today, four generations on, our family is faced with the murder of our kin in Gaza. 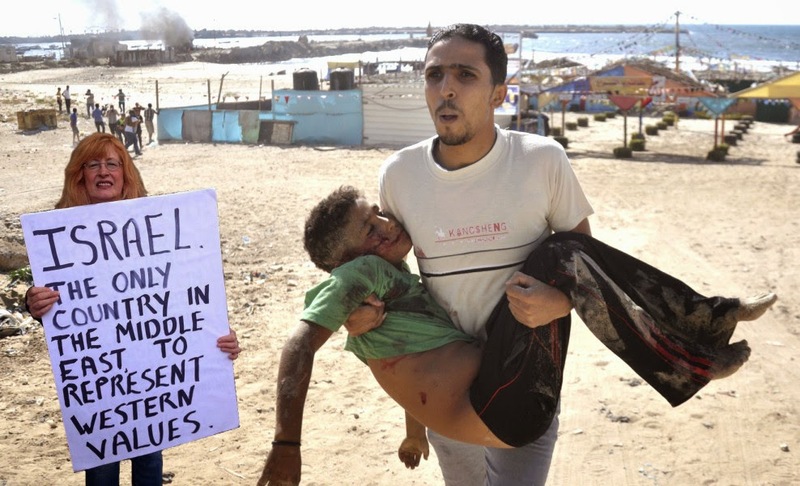 Murder carried out by the State of Israel,” he wrote. The Israel Defense Forces Spokesperson’s Unit did not answer Haaretz’s questions as to whether the Ziadah home was bombed by mistake, or if not, who in the house was a target and whether the IDF’s legal department considers the death of six civilians to be legitimate collateral damage. Its response said merely that the IDF invests great efforts in trying to avoid civilian casualties, is currently working to investigate all allegations of irregular incidents and will publish its conclusions after this investigation is completed. On 12 September 1935 the Nuremberg Laws were announced at a mass Nazi rally by a Nazi physician Gerhard Wagner. 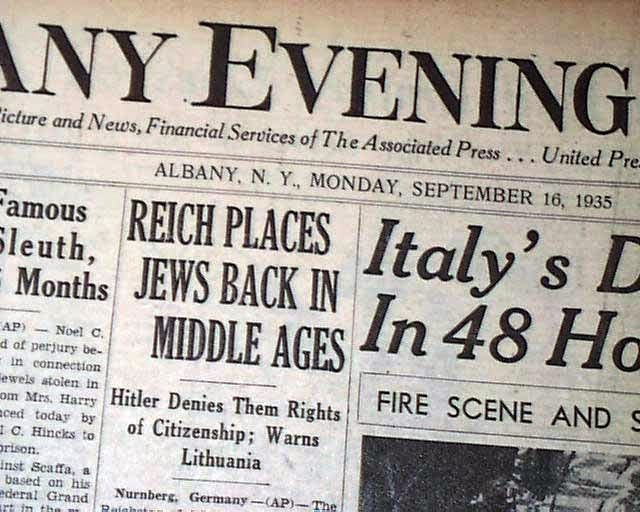 On 15th September they were enacted by Hitler into law. The first was the The Law for the Protection of German Blood and German Honour (the second was the Reich Citizenship Law). 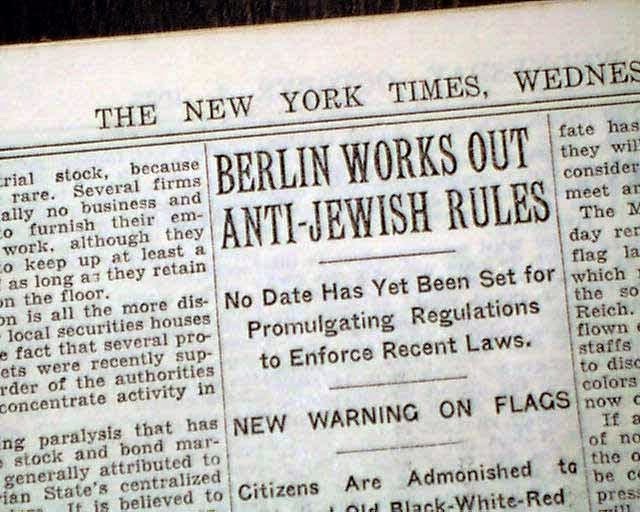 They were two of only four laws passed by the Reichstag. Dr. Bernhard Lösener, the Interior Ministry official in charge of drafting anti-Semitic laws, was tasked with drafting a definition of who was a Jew and came up with anyone who had 3 or 4 Jewish grandparents (1 or 2 meant you were a mischlinge - mixed race). They were described by Gerald Reitlinger in The Final Solution (p.7) as ‘the most murderous legislative instrument known to European history”. Zionism however, as a racial Jewish political movement had no objections to what was, after all, the fulfillment of their own program. 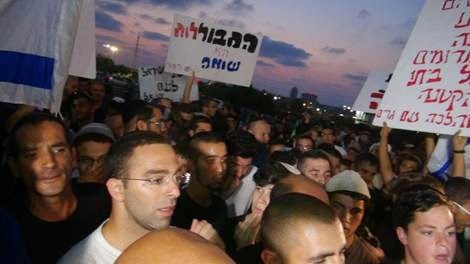 So it is in Israel today that hundreds of protesters demonstrated against the marriage celebration of a former Jewish woman and a Muslim man, daring to equate it with Jewish lives lost during the holocaust. Can one imagine any other western (or indeed any other civilised) state where people demonstrate against two people who, although of different ethnic/religious backgrounds, wish to marry each other? In this country such opposition is confined to marginal fascist groups like the NF or BNP. In Israel it is part of mainstream Zionist politics. Although it hides the fact, not least from many diaspora Jews, in Israel there is no civil marriage. You have to marry someone of the same religion, but whereas Christian and Muslim marriage requirements are lax, to be Jewish i.e. part of the select, is a difficult and lengthy process. The demonstrations over this marriage says all you need to know about Israeli politics and, incidentally, the nature of the Israeli court system, which in the case of high public officials, contrasts freedom of speech with the right to privacy. 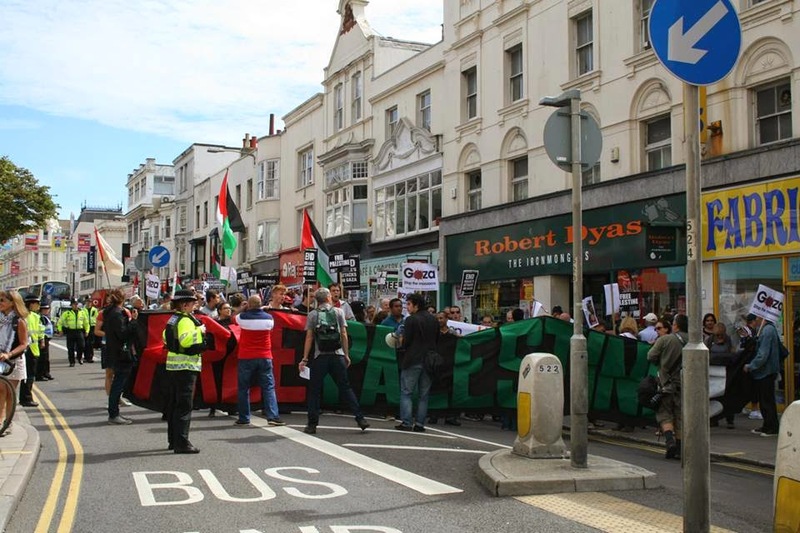 The organisation Lehava which has organised these demonstrations is funded mainly by the Israeli state. Although the new Israeli President, Reuven Rivlin, whom Netanyahu bitterly opposed, has condemned the demonstrations, Netanyahu himself has said nothing. It is clear where this pro-American ‘moderate’ stands. It is ironic that the 'Jewish' state, allegedly set up as a result of the holocaust, echoes Nazi discrimination against the Jews. "If it were someone from her family, I would understand, but these people aren't related. Why do they care? Why are they getting involved? If they think they'll get us to give up on each other, it won't happen." He said that hiring the security guards had cost over $4,000 (£2,400), half of which was being paid for by the wedding hall, but the remainder the couple had to find themselves. The court decided that protesters would be allowed to picket the wedding, but only at a distance of 200m. Lehava, which campaigns under the slogan of 'saving the daughters of Israel', was revealed to have links with the Israeli government in a 2011 investigation by Haaretz, receiving up to $175,000 per year from the state, over half of its operational budget. 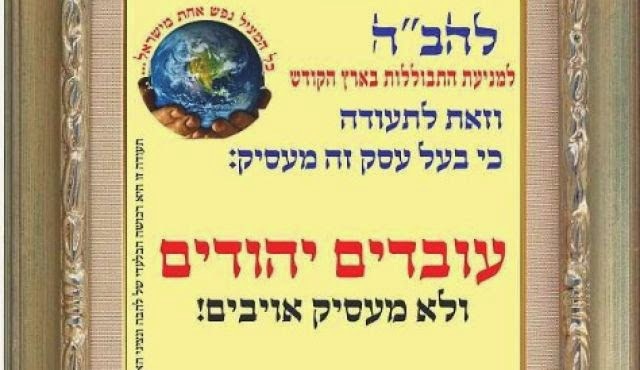 In 2012 the group distributed flyers in east Jerusalem warning Arabs not to visit the mostly Jewish western side of the city, and has campaigned against Jews and Arabs mixing on beaches and Jewish landlords renting to Arabs. The page, published on 13 August, has got over 2,000 likes and over 4,000 people have written responses asking the bride to cancel the reception and leave her husband. Speaking to Haaretz, however, Mansour said he had also received many letters of support. "We feel great, and that really gives us strength. They think they'll break us, but we can't be broken. The opposite is true – we're getting stronger," Mansour said. Israel's mixed marriage controversy: How low have we sunk? Could we imagine a wedding between a Christian and a Jew becoming national news in a European country? That the marriage of Mahmoud Mansour and Morel Malka became a subject for public debate is embarrassing and testifies to how low we have sunk. Could we imagine a wedding between a Christian and a Jew becoming a national news item in any European country? 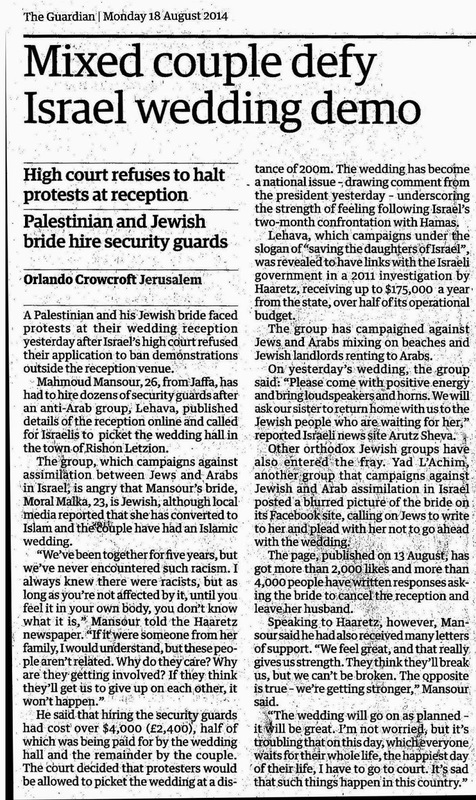 Indeed, the Lehava organization that launched a public protest against this wedding is worthy of every condemnation. But we must remember that racism didn’t start with Lehava: Israeli law doesn’t permit marriages between people of different religions, and if Malka had not converted to Islam, the two could not have married in Israel, where marriage is subject to religious law. Of course, such a couple can get married abroad and be registered as married here in Israel, or they can live together and be recognized as a cohabiting de-facto couple under Israeli law, but it’s worth remembering that. We cannot merely be outraged by Lehava without addressing the manner in which the ban on intermarriage serves in practice the notion that we must “protect” Jewish women from the “Arab threat,” as Prof. Zvi Triger of the College of Management has demonstrated in his research. 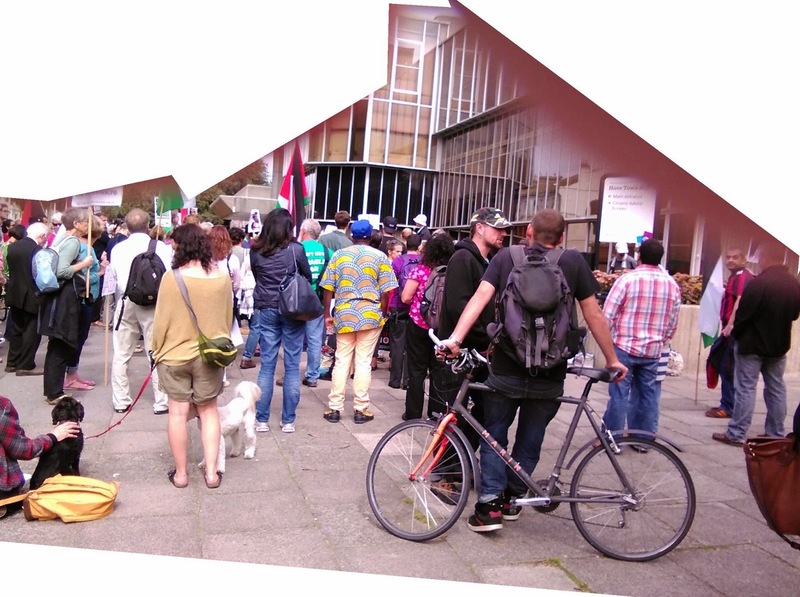 While allowing Lehava to demonstrate, the Rishon Letzion Magistrate’s Court, from which the couple sought an injunction, ordered the Lehava demonstrators to stay at least 200 meters from the banquet hall – a compromise to which the couple agreed. But was that far enough? In a case where demonstrators sought to protest in front of the late Rabbi Ovadia Yosef’s home, the High Court of Justice ruled that with regard to a demonstration in front of the home of a public figure, the right to privacy may trump the right to demonstrate. The court therefore ruled that one must assure that one party’s right to assemble does not substantially impinge on the other party’s right to privacy, and thus police were permitted to set reasonable limits regarding the timing, place, and manner of the demonstration. The High Court has reiterated this principle in several similar instances. The Rishon Letzion court, therefore, could have taken these legal principles into account when deliberating the couple’s request, and ruled against holding the demonstration near the wedding venue altogether – even more so because at issue was the marriage of private people, not public figures, giving the right to privacy even greater weight. It should also be noted that when a demonstration needs a permit, the police is allowed to check whether incitement to racism is involved. While such considerations ought to be invoked on very limited occasions, it should have at least been grounds for keeping the demonstration even further away. Given all this, one cannot ignore the gap between how Lehava’s right to hold a racist demonstration near a private celebration was preserved, and the many freedom of assembly violations we’ve witnessed recently: The police ban on an antiwar protest in Tel Aviv 10 days ago; the many instances in which protesters were arrested during social-justice demonstrations; and the 1,500 antiwar protesters arrested over the past month, nearly all of them Arabs, as reported here over the weekend. Apparently, problematic demonstrations against Arabs are permitted, but Arabs who demonstrate are at high risk of arrest. Under heavy police guard, Mahmoud Mansour and Morel Malka held their wedding celebration last evening in Rishon Letzion. Mansour, a young Muslim man and Malka, who was born Jewish and converted to Islam, were surrounded by security guards as they arrived at the Shemesh Aduma (Red Sun) wedding hall. 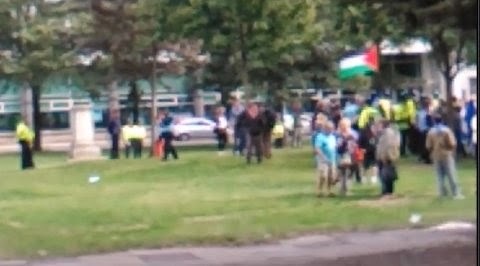 Outside, about 150 meters away from the entrance to the hall at the end of the street, some 200 right-wing protesters demonstrated against what they called “assimilation in the Holy Land.” A counter-demonstration was held by the entrance to the hall. Earlier in the day, the court refused to prohibit the protest outside the wedding hall where the mixed Muslim-Jewish celebrated their recent marriage, and ordered protesters to remain at least 200 meters from the venue, which is located in an area filled with supermarkets and other banquet halls. The Rishon Letzion Magistrate’s court issued the ruling after the couple applied for an injunction to stop the demonstration organized by Lehava (which is both a Hebrew word meaning “flame” and a Hebrew acronym for Preventing Assimilation in the Holy Land). Each guest at the wedding was asked by police to identify themselves and answer questions posed by police and security guards to prove they had been invited. The protesters attempted to come closer to the hall a number of times while cursing the couple, but the police moved them back to the area set aside for their protest, as per the court’s instructions. 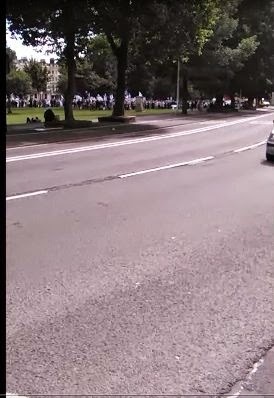 The protesters shouted racist and threatening slogans such as “Death to leftists,” and waved Israeli flags and blew the shofar. They carried signs saying such things as “Daughter of Israel to the people of Israel,” and “Assimilation is a Holocaust.” At the counter demonstration they held flowers and sang love songs. Their signs said things such as “Love for everyone,” “Only love will win” and “1,000 flames will not put out love.” A few of the guests thanked them and honked their horns in support. A number of the right-wing protesters complained about being unable to approach the hall and swore at the guests and the counter protesters. 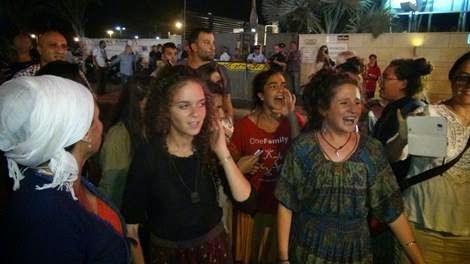 Attorney Itamar Ben Gvir, a leading Kahanist who represented Lehava in court, said the court’s decision to allow the demonstration near the hall was “a victory for the freedom of speech. Only this morning they tried to prevent us from protesting and I am pleased the court accepted in practice our position and allowed freedom of expression. This is a democratic country,” he said. “I think we have the right to protest against assimilation. That is what we have come to do today,” said Ben Gvir. The couple lives in Jaffa and have already had a legal Muslim wedding; last night’s event was only a celebration. The couple met five years ago and Morel converted to Islam. Mansour said that up until the past few days they had not experienced such blatant manifestations of racism. Malka said her mother, sisters and other relatives were slated to attend; her father, however, is opposed to her marriage to a Muslim and had declared that he would not attend the party. In court yesterday, the representative of the police proposed holding the demonstration in a parking lot about 200 meters from the hall. Judge Iriya Mordechai ruled that the protesters must remain at least 200 meters from the building, even if they refuse the parking-lot space offered to them. She stressed that her ruling was aimed at preventing friction between the demonstrators and the guests at the event, which was held under heavy police guard. Segev called the judge’s decision precedent-setting, saying it was the first time an Israeli court had approved the request of a private person to prevent a demonstration near a private event. 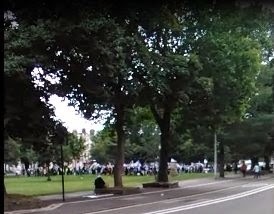 Nationalist leaders head mass protest against wedding of Arab and Jew, warn danger of assimilation greater than Hamas rockets. 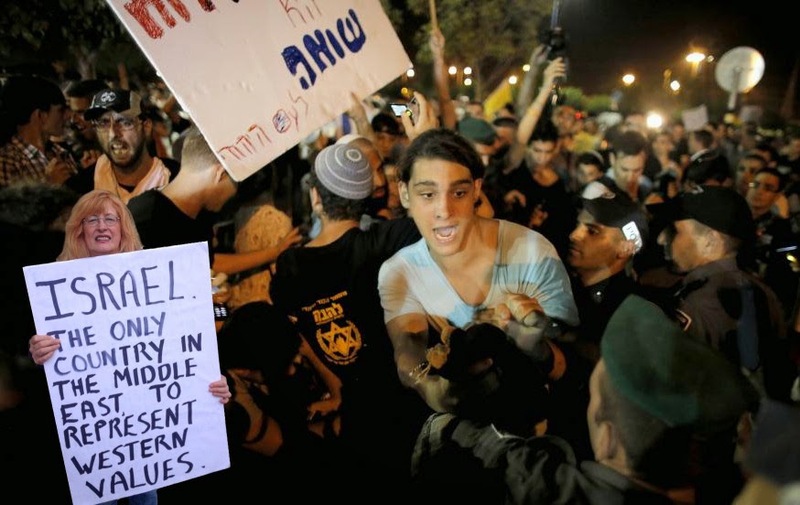 Hundreds of protesters arrived to demonstrate Sunday night against the mixed marriage of a young couple from Yafo: Moral, a 23-year-old Jewish woman recently converted to Islam by her groom, Mahmoud Mansour, a 26-year-old Muslim Arab. At the protest led by the Lehava group which fights assimilation in Israel, former MK Dr. Michael Ben-Ari addressed the crowd, saying "Moral, it won't help you. They always will remind you that you're Jewish and where you came from. The children you give birth to will never be treated as equal to them." 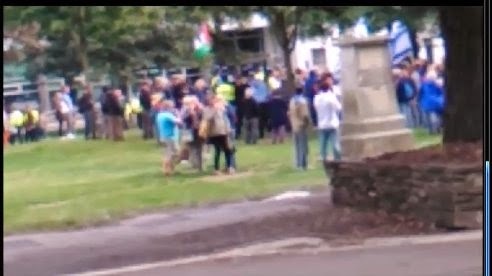 "They tell us that we're racist - let's see one Arab woman come marry a Jew at this hall...then we'll see who's racist," added Ben-Ari to the protesters. He was referring to the fact that a Muslim woman who marries a Jew can expect to be murdered by her co-religionists. As noted by Ben-Ari, in nearly all cases of mixed marriages with Arabs in Israel, the Jewish partner is the bride. It is a well documented phenomenon that such wives often suffer abuse from their Arab husbands, and many require help to escape. Ben-Ari noted that former Prime Minister Golda Meir, "a prime minister of the Labor party, a representative of the left, etc. - when she spoke about assimilation she said...'whoever marries and assimilates joins the six million (Jews murdered in the Holocaust). She saw in what's happening here a continuation of the work of (Nazi Leader Adolf) Hitler." Six protesters were arrested for disturbing public order as over 100 police officers were on site to secure the event at its Rishon Letzion wedding hall venue. A court case Sunday morning allowed the protest providing it stayed 200 meters from the wedding hall. 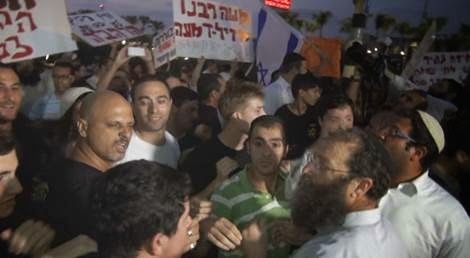 Nationalist public figure Baruch Marzel also spoke at the protest against the wedding, a marriage Moral's father refused to attend because of his opposition to his daughter's disengagement from the Jewish people. "Two months ago we sent thousands of soldiers to prevent the danger of Hamas in the south. But the danger assimilation poses to the Jewish nation is a danger a thousand times worse," said Marzel. Marzel called on Jews in Israel to wake up before "what happens abroad, where every second Jew assimilates, arrives in Israel," in a reference to the remarkably high assimilation rates in America and Europe. Opposite the Lehava protest several dozen leftists held a counter-protest, decrying the supposed "racism" of opposing assimilation. Jewish law expressly forbids marriage with non-Jews who have not undergone a proper conversion to Judaism. The marriage has been garnering mass media attention, and was even commented on by newly instated President Reuven Rivlin, who wrote on his Facebook page Sunday "the revelations of incitement against (the couple) are outrageous and worrying, regardless of whatever my position or that of another will be on the issue (of mixed marriages)." 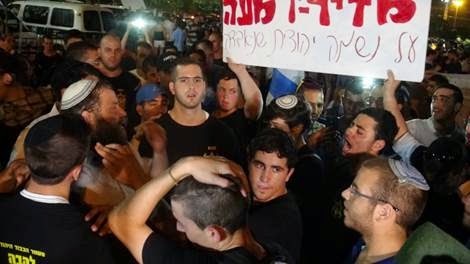 Responding to Rivlin's criticism, Attorney Itamar Ben-Gvir stated "it's sad to hear that the state president is ignoring the danger of assimilation and encouraging assimilation, instead of coming with us to protest this disgrace." "I expect Mr. Rivlin to dedicate his time to the war on assimilation in Israel and globally. Because today it's Moral, tomorrow it could be his granddaughter," added the attorney. 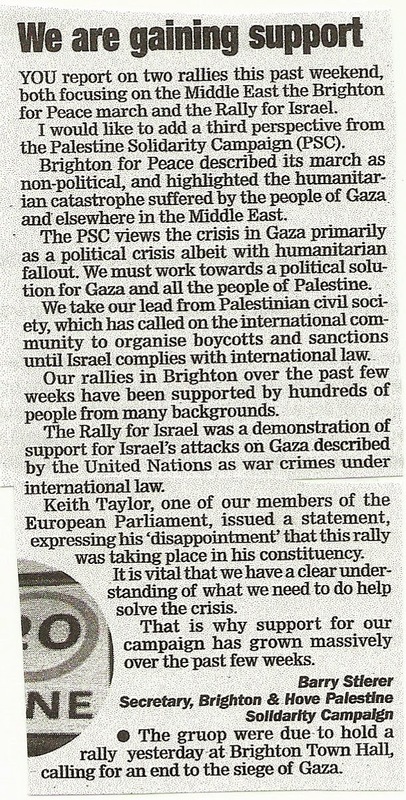 Not long ago I wrote to you about the racist-fascist atmosphere which prevailed in Israel just before the war on Gaza. This atmosphere was initiated by extreme racist, national religious groups. These activities are contrary to Israeli law, which forbids incitement to racial or religious hatred. However, the government and police turned a blind eye; the incitement was not opposed by the state legal-educational-cultural apparatus. As a result, intolerance, racism and hatred became the dominant mood in the streets. Many Israeli Jews, normally not even politically right wing, succumbed to this racist mood and followed it sheepishly. This atmosphere of hate and revenge coincided with the onslaught of the war and fed the huge support for the government and the violence against the tiny left which opposed the war. Today I want to bring to your attention yet a new example of the racism presently running wild in the country. The difficulty of marriage between Jews and non-Jews in Israel is well known. There is no civil marriage in Israel and "mixed" couples have to get married abroad. Today's story is special because it takes the issue to a new, uglier, level. I regard it as yet another indication of the new phase that Israel has reached!